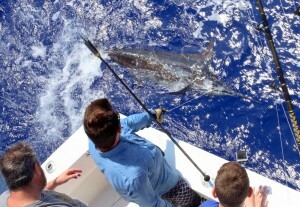 We were two-for-two with blue marlin releases today! Welcome back Captain Joe Shoemaker. We had two releases before noon for our guests from Ontario, Canada. 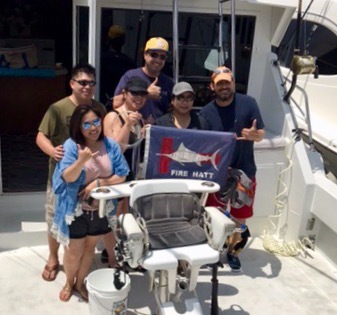 The group are vacationing aboard the Pride of America Cruise Ship and spent the day fishing aboard Fire Hatt. 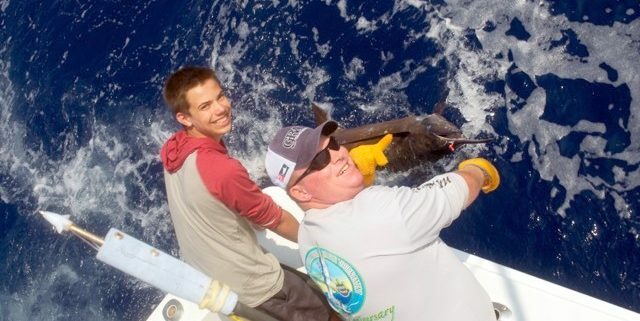 Macon, Georgia came to Kona late in the season to try their luck at catching a Pacific Blue Marlin and to enjoy a family fishing trip. They had never caught a fish larger than 20 pounds. They baitfish in Georgia and I believe it was their wedding anniversary. They are a very cute and very gracious Southern couple. When they met, Joy was 15 he Richard was 16. (She said no, you were 17.) Not to mention this was on their “Bucket List”. We left the harbor and had been fishing for about 2 1/2 hours and got our first bite! The fish was on and taking line for about five minutes and then shook the hook. As the day was coming to an end and the thrill of the first fish was merely a memory, we were headed back towards town when the long rigger line came down. We are Hooked Up! Richard is in the chair and the battle begins. It is such a thrill for me to look at an angler make their way to the chair, get locked in and hear the screaming reel and feel the weight of the fish! As we clear the deck and start backing down we are at a standoff. Richard gets into rhythm and we start collecting line back. After a half hour fight, we have the fish beside the boat and Brett holds it until Richard can get out of the chair and touch the beautiful estimated 225 lb Pacific Blue Marlin before we release it. Check this off the Bucket List! 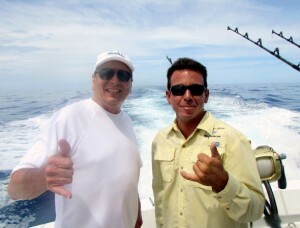 Big Blue Marlin Fishing In Kona Hawaii. 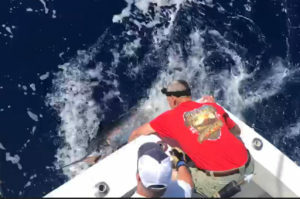 We probably should report this as Big Blue Marlin Catching in Kona Hawaii! 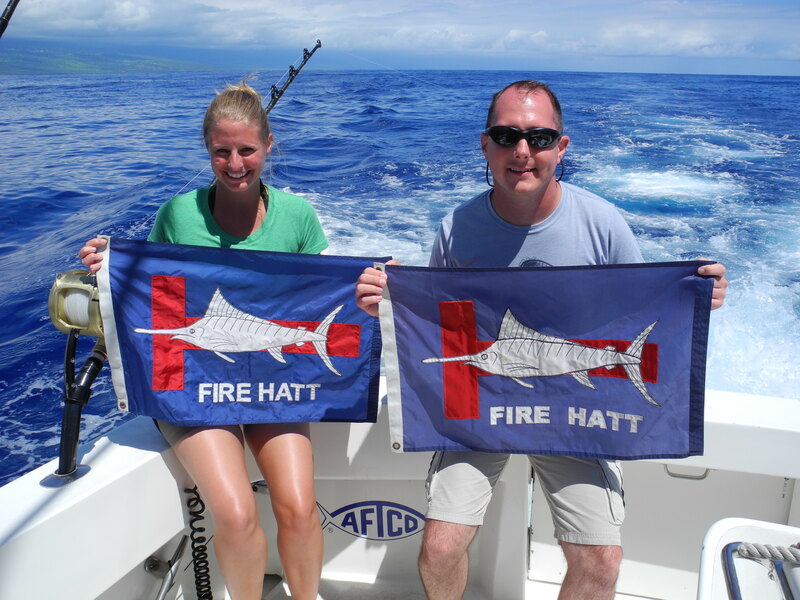 This has been a phenomenal month here in Kona with at least 11 Tag and Releases for Fire Hatt. We only kept one Marlin as we could not revive him. To top our scorecard, Brett Bailey from Saskatoon, has our boat record so far this year with an estimated 600+lb Pacific Blue Marlin release. Bret and his co-workers chartered Fire Hatt while the other group chartered another boat. They had a friendly wager on which group would produce the largest fish. We started out with a Shortbill Spearfish bite that put them ahead of the game with angler Garry Fawcett landing the 50 pounder! About an hour later we hooked the 600+ pounder. Brett was the angler and after 45 minute fight we had the fish to the boat with a clean and healthy tag and release. I hear the wager was Infinity Drinks at the Four Seasons? 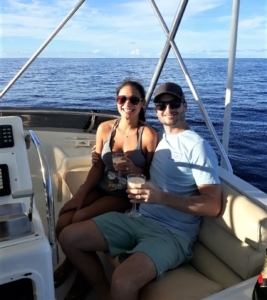 Honeymoon couple John and Erica Heckathorn from Kansas City, MO had a banner day releasing two Pacific Blue Marlin. Erica was “first up” bringing in an estimated 275lb trophy. Now the competition is on! We needed to get John a fish too. We stayed true to the area as there were reports of more fish. We worked for about two hours when finally we were hooked up with a fish for John. 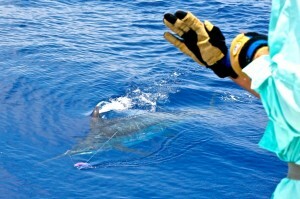 John’s Blue Marlin was estimated at about 175lbs and was successfully tagged and released after a short 20 minute fight. Nice going you guys! 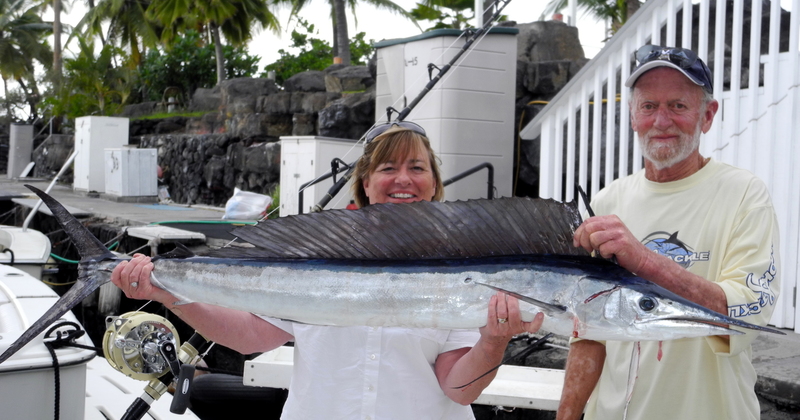 When a Woman Loves her Man, She Takes Him Fishing in Kona Hawaii. That is what Lisa Yellowlees from Victoria, BC did for her sweetheart, Rod Bieller. 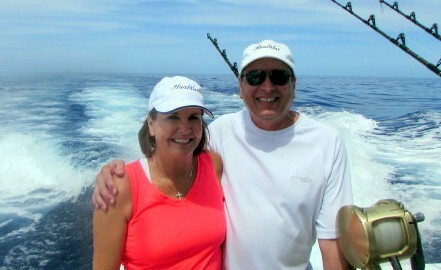 Rod loves to fish, especially in Kona Hawaii, so for a “milestone birthday”, Lisa called us months in advance and arranged the surprise fishing trip for him. There was a good prpbability that he would be calling to book a trip anyway, so we had to steer him to the date already planned for him. This was so much fun to be a part of. Rod and Lisa have fished with us several times in the past and we were looking forward to going again. Rod is a retired Fire Battalion Chief from Victoria so we have a lot in common. So now we have a surprise charter for Rod, we are out almost all day before we finally get a bite. This nice Ono (Wahoo) was just what we needed. You don’t want to get skunked on your birthday. 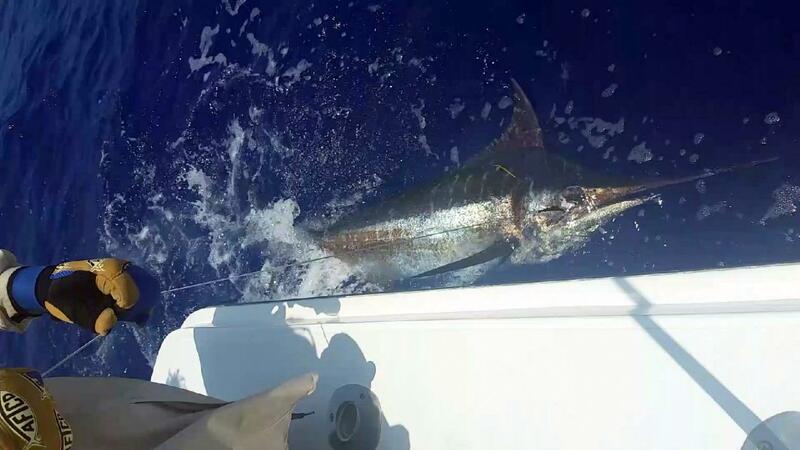 January and February into March are excellent months for Shortbill Spearfish, Ono and Striped Marlin. There are some nice Ahi Tuna around too. 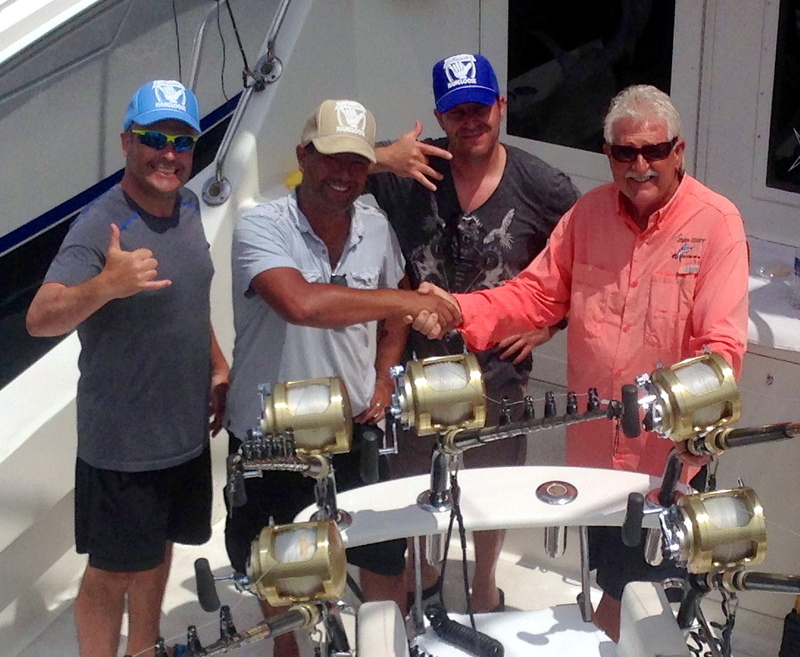 These months transition into the famed Pacific Blue Marlin months ahead. Although Pacific Blue Marlin are caught here year around, they show up in numbers in the summer months. 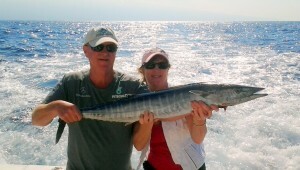 Featured in the photo above is Rod Bieler and Lisa Yellowlees proudly showing off the nice Ono.